From April 2015 to May 2017, the Mekong Migrant Network, a sub-regional network of civil society organizations (CSOs) and research institutes conducted a research project to review the labor migration governance mechanisms of countries of origin, including national policies, common practices, and international standards. Through consultation meetings with migrant workers in Thailand and returnees in Cambodia and Myanmar, along with interviews with Cambodian and Myanmar government officials, inter-governmental organizations, and recruitment agencies, the study analyzed the policies and practices of these two origin countries. Those policies or lack thereof were then compared with those the Philippines and Indonesia have put in place to protect their nationals migrating abroad. 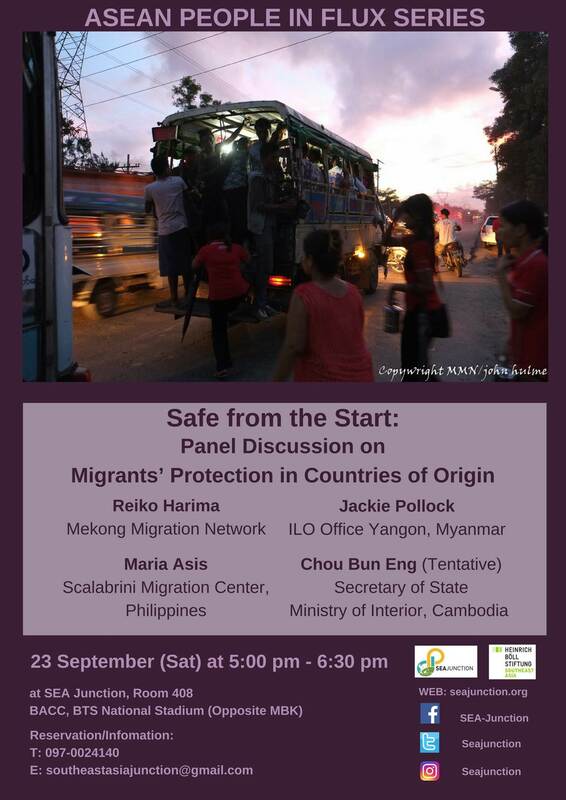 The findings were compiled in a report “Safe from the Start: The Roles of Countries of Origin in Protecting Migrants”, which was presented at a Policy Dialogue in Yangon, Myanmar, last July. Based on the evidence collected a number of recommendation were made and discussed with representatives of the Cambodian and Myanmar governments, private recruitment agencies, the Philippine Embassy in Yangon, ILO, IOM, and CSOs from Cambodia, Myanmar, Thailand, and the Philippines. This is the fourth of a series of events on movements of people in Southeast Asia entitled ASEAN People in Flux, which is organized by SEA Junction in collaboration with the Heinrich Boll Stiftung Southeast Asia. The series consisting of seven interrelated events aims to examine the complexity of intraregional mobility spurred by regionalization efforts and to discuss the policies governing it. In particular, by putting a spot on different kinds of people’s movements, the series highlights the double standards in the ASEAN’s approach to mobility. On one side, ASEAN promotes “people to people connectivity” by facilitating movements for business, study and tourism, while on the other side it limits migration of much needed “un-skilled” workers to exploitative contract labor schemes and it refuses to recognize refugees, asylum seekers and displaced persons. These double standards were clearly illustrated by the first event of the series on “refugee crisis in ASEAN” as contrasted to the booming industry of medical tourism discussed in the second event. This third event presented an additional dimension of policy discrimination from a gender perspective by focusing on women migrant workers in ASEAN. NB: The event is free, but donations welcome!